This product as a Factory First includes a warranty! Product information "HAIX Black Eagle Safety 52 Low, FS"
Black leather work shoes are taken to a new level of comfort and construction with the Black Eagle Safety 52 low shoe. This low shoe in quality, waterproof and Sun Reflect black leather is just 3 inches tall. It may feel more like athletic footwear than a safety shoe; however, the Black Eagle Safety 52 low gives you protection the whole time you are on duty. These men's black leather work shoes are super lightweight, and will make you feel athletic when walking and moving. The metal free design keeps you safe from electrical hazard, while the CROSSTECH® inner liner provides waterproof protection which is breathable and light. The composite toe cap material ensure light and comfortable toe protection. With sizes from 4.5 to 15, there is a shoe for every foot which needs one. Smooth, water resistant European black leather offers long lasting good looks and durability. Sun Reflect treated leather aids in keeping a cool and comfortable inner climate. Pair that with the HAIX Climate System and your feet are going to thank you for keeping them cool and comfortable all day long. Sporting a carbon composite safety toe cap, your toes will thank you if they ever get in a pinch! Its rubber edged toe cap prevents your toes from feeling the pressure of the toe cap edge you can sometimes feel in other safety shoes every time you take a step. When you are in a hurry, use the rear pull tab at the top of the heel to pull these shoes on fast. The quick smart lacing feature save you the hassle of having to tie your shoes, and the laces stay neatly tucked away under a storage flap at the front of this men's black leather work shoe. The HAIX® Black Eagle Safety Boots come with a removable, antibacterial insole which is designed to cushion and protect your feet. These men's black leather work shoes' insole does double duty as a cushioning pad which is moisture wicking. The insole material is moisture wicking to keep you dry under any conditions. Special CROSSTECH® inner lining is blood borne pathogen and chemical resistant. CROSSTECH® has created an insulated liner which is also waterproof and breathable for maximum comfort. Make wrinkles a memory rather than a problem with the Secura Liner® feature which is designed to prevent the inner lining from ever pulling up or out of the footwear. Prevent standing fatigue with the arch support of the Black Eagle Safety 52 low; these men's black leather work shoes hug your heels and support your arches in all the right ways. Pronation support in the mid and insole area help your feet absorb shock and adapt to walking on uneven surfaces. Black Eagle Safety 52 provides protection without sacrificing athletic performance, especially when spending a lot of time on their feet. Metal free puncture protection is a standard part of the HAIX® Black Eagle Safety Boot, keeping you safe from puncture hazards. The outsole is designed to be non-marking and will provide all weather grip from heel to toe. Specially patterned sole provides exceptional grip with wide enough spaces to avoid rocks and other materials clinging to the bottom. The sole is oil, fuel, and skid resistant. In addition, these shoes are rated for electrical hazard resistance. The sole on the Black Eagle Safety Boot can be re-treaded as well providing you with many more years of shoe life. 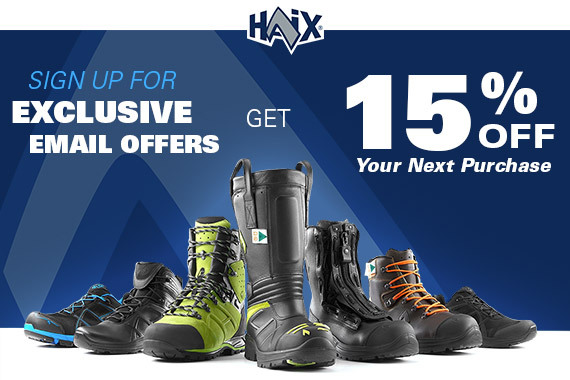 HAIX® offers premium, certified footwear for hard work and long hours on the job. ASTM F 2413-2011 - an international safety boot standard from ASTM. CAN/CSA-Z195-2014 - CSA and Canadian standards for safety and work boots. Out of warranty footwear can be refurbished with original factory parts through an extended wear package. This package includes any necessary replacement or repair of stitching, profiled rubber toe caps, insoles, and retreading of soles. Footwear will be cleaned and deodorized. HAIX footwear owners also have the option of a sole retread only or a toe cap replacement only. Related links to "HAIX Black Eagle Safety 52 Low, FS"
Our comment on "HAIX Black Eagle Safety 52 Low, FS"
IMPORTANT NOTE: Factory Seconds are boots which may have minor blemishes or imperfections. Factory Seconds boots are sold "as is" with no manufacturer warranty and are not eligible for warranty repair or replacement under any circumstances. Customer reviews for "HAIX Black Eagle Safety 52 Low, FS"
Great set of boots, especially to wear with shorts. Comfortable set of shoes. It takes a couple days to get the broke In but after that they a very comfortable. Size is pretty much the same as normal shoes. I like these shoes so far. I have been looking for comfortable and protective shoes for use at work in the emergency department (I am and ED nurse), where I am on my feet for most of the night. I also have knee problems , ankle problems, collapsed arches , and shin splints. The shoes are supportive and absorb shock well. I may end up switching the insoles to something with a bit more arch support. These shoes wear like boots, and require break-in time. I wear thin socks at work, and the shoes fit well with those, but if I were to wear thicker socks (like with my other job, doing ambulance EMS), I would want them a size wider. I normally wear a size 13 or 13.5 extra wide, but due to size availability I bought a 14 wide. It would be great if these shoes were available in extra wide. I think I made a good choice in purchasing the shoes, and am hoping that they will hold up to years of use. Additionally, the lacing system takes some getting used to, but seems to work well. Purchased the Factory Seconds and couldnt be happier, saved money and the very minor blemish buffed right out. Strong shoe/boot to wear with shorts. Great customer service from Haix, they even sent me some stickers. Bought these shoes for instructing fire service programs in PA. I wear these shoes all the time. They the most comfortable shoe to wear all day! You differently will be glad you bought them. Thank you for your review of the Black Eagle Safety 52, FS. We are happy to hear that they have served you well and that they are comfortable while on the job. We appreciate your recommendation and for being such a loyal customer! Nice shoe and not heavy on the feet. Ordered this shoe online in my normal 9.5 Medium width. When it arrived, I tried it on and the shoe was narrow. It was rubbing the inside of my big toes and narrow around the arches. Called them and they told me the shoe does run narrow and i could return my shoes for a 9.5 Wide. Hopefully the shoe will be shipped to me shortly and will fit properly. We are sorry to hear that your first pair of Black Eagle Safety 52 Low, FS did not fit properly. We hope that the wide will work out better and will serve you well on the job. Please call customer service (866-344-4249) if you continue to feel discomfort, as they would be happy to troubleshoot the issue with you. This is my 3rd pair of shoe/boots . I'm not sure if its because they were factor second , they look great but after a week of geting blisters ever day. They have been in my closet . We are sorry to hear that you do not share the same positive opinion that the majority of our customers have about the Black Eagle Safety 52 Low. Please call our customer service department at 866-344-4249. They would be happy to speak with you about your boots in an effort to resolve any comfort issues you might have. They are very durable and shine up well and especially they are comfortable. We really appreciate the feedback and are happy to hear that you are enjoying your boots. We hope you will continue to be a customer in the future. Quality, stylish and comfortable work shoe. I had originally ordered a 12.5 medium width as my shoe size is between a 12 and 12.5. The 12.5 fit extremely well but my big toes were rubbing due to the narrow toes area. I ordered a size 13 and have the same comfortable fit with more toe room. The original ordered was refunded with no issues. I upgraded my work duty shoes and boots to Haix in 2006 and they are my only choice for safety, performance, durability and comfort.